Four artists of different disciplines, Deidra “Krucial” Cooper, Lynnée Denise, Kohshin Finley and Keith Wallace, spoke during Oxy’s “Art and Activism” event in Bird Studio April 4. 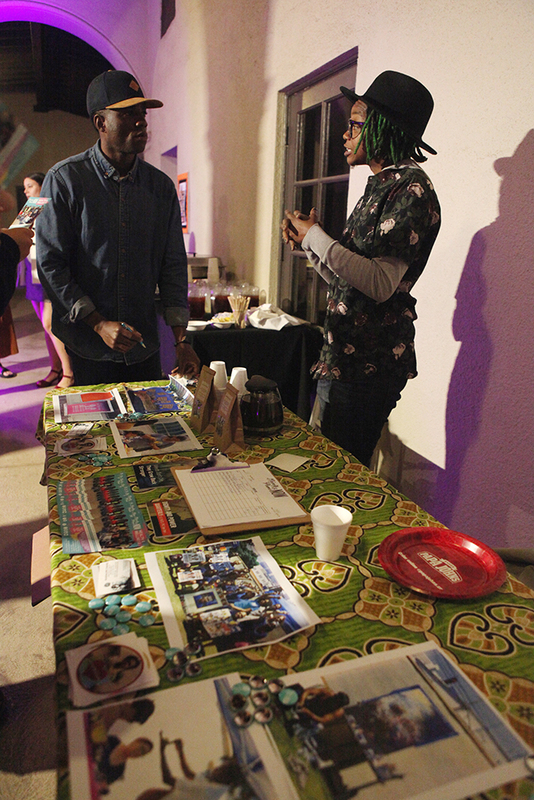 The event focused on the intersection between artistic expression and advocacy and was organized by Oxy Arts and co-sponsored by Black Studies and the Black Student Alliance (BSA), according to Director of Oxy Arts Meldia Yesayan. Each artist spoke about their experience as an artist in Los Angeles and how they use their art to advocate for social change. The panel was followed by a reception where attendees could learn about local social justice organizations, including Dignity and Power Now and Gender Justice LA. Yesayan said Oxy Arts organized “Art and Activism” to create a space for the campus and local community to reflect on their shared values and collaborate in ways that can lead to transformative change. “We encourage students to reflect on the current social climate here at Oxy and beyond. We hope they consider art as a vehicle for change and are able to come away with some ideas for action,” Yesayan said via email. According to Yesayan, each artist was chosen because they work in different disciplines within the arts, including dance, music, theater and visual art. Each is recognized as forward-thinking within their field, Yesayan said. She also said artists across all genres and throughout history have been agents of change, and their artistic productions reflect the social and political climate of their community. DJ and writer Lynnée Denise said for people of color, art is a way to channel anger about and offer a creative response to injustice. According to Denise, understanding the social and political history behind art is a way to connect it to one’s own activism. “I advocate for people to understand the political nature of black music and that it offers an alternative and more honest reading on American history,” Denise said via email. Denise said an important part of combining art and activism is studying art for its cultural significance. She said students who are interested in connecting their passion for art to advocacy should learn about the social context of the art they love and the main artists within their genre. “Students have the role of doing their homework so that they understand what has come before them and be able to contribute based on a sense of awareness about the issues and how they’ve been addressed in the past,” Denise said. Yesayan said she wanted students to learn that art and being an artist is a way of speaking out about causes one is passionate about and changing how people view the world around them. “Much like these other forms of expression, and maybe moreso, arts and culture have the ability to move us through a sense of shared human experience. Artists are thought leaders and influencers with a unique ability to mobilize and activate communities,” Yesayan said via email. Actor, filmmaker and playwright Keith Wallace said during the panel that he uses his art to bring attention to the causes that are important to him. Wallace said art of all forms is an integral part of political resistance and advocacy because it appeals to the core of what makes all of us human and connects people to each other. Deidra “Krucial Kase” Cooper, a dancer, instructor and choreographer, said during the panel that dance is the voice she uses to express what she wants to say without words. According to Cooper, a big part of being an art activist is not to look for external validation or permission from others to express yourself. During the panel, painter and Los Angeles native Kohshin Finley said artists can use many different mediums to get their message across. He said it is important to find an art form that is your own. According to Finley, people shouldn’t also feel fixed in a single art form because this can limit artistic expression. “I can tell a lot with paint but I can’t tell everything,” Finley said. Wallace said he also changed his mode of artistic expression because of his activism work. According to Wallace, he started out as an actor but transitioned into writing and directing once he learned that using those forms allowed him to create a bigger platform as an activist and reach more people. “Moving from being an interpretive artist to a content creator seemed like a natural progression for the impact that I wanted to make with my art,” Wallace said. Wallace said he hopes students will be inspired by this event to start advocating within their sphere of influence.